1. Amendment to the ARHSEPP 2009 passed. The NSW government has just passed its second amendment to the Affordable Rental Housing State Environmental Planning Policy (ARHSEPP) 2009, pulling back planning concessions for ‘New Gen’ Boarding House developments. This change now sets a 12 room maximum to boarding houses in low density R2 zones (See at the end of the article for links and further details). This comes on top of increased parking requirements for BH developments under the ARHSEPP, which now require one parking spot per two rooms, up from 1 parking spot to 5 rooms. POANSW argued in our submission that Boarding house residents have extremely low private motor vehicle ownership rates, and thereby this change was not warranted and would only lead to a reduction in BH supply. Unfortunately we did not have any data to back up our “low car ownership” assertion. Since then POANSW has been contacted by ptc in relation to this issue. ptc is a private parking and traffic consultancy which has been working with boarding house owners for quite some time, and thus is aware of the issues which have arisen from the changes. ptc. is conducting a study to establish the actual parking requirements for typical Boarding Houses. 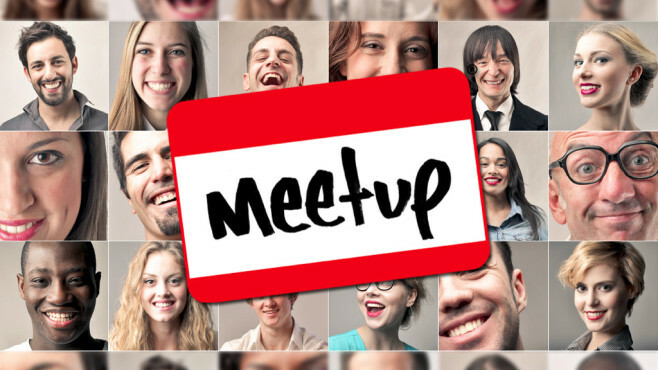 This information would then be utilised to generate Traffic Impact Assessment Reports, based on real data, that could assist in development applications. POANSW will soon distribute by email the ptc study to members. We encourage Boarding House operators to complete the questionnaire, so as to assist in establishing the true impact of Boarding house developments on local parking demand. A further email on the ptc study will be distributed soon. 2. Interesting Data on BH numbers. 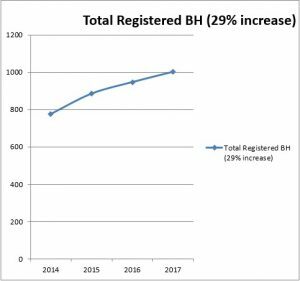 Figure 1: Shows the Total number of BH registered with NSW Fair Trading (2014-2017) since The Boarding House Act (2012) introduced mandatory registration. This graph reflects the ongoing process of established BH registering, but also provides an insight into the rise in New Gen BH. Overall, there has been a steady increase of 29% from 2014-2017. Further note there were some 800 BH development applications at NSW councils seeking approval last year . (Based on various media sources, and prior to the abovementioned amendments to the ARHSEPP in 2018). Given the above, POANSW estimates the number of total registered BH will continue to rise in the short to medium term, but we envisage that the two recent changes to the ARHSEPP will see a windback in new BH development applications.. Figure 1: SOURCE: Evaluation of the Boarding Houses Act 2012 – Final Report and various interim reports https://www.adhc.nsw.gov.au/search_results?q=EVALUATION%20OF%20THE%20BOARDING%20HOUSES%20ACT%20). Figure 2: Shows the number of BH obtaining NSW Revenue BH Land Tax exemption. These boarding houses are required to meet various criteria including tariff limits, and can be taken as a proxy for the ‘traditional affordable’ BH sector. 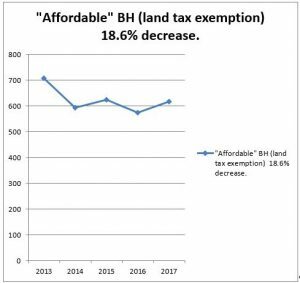 Note the impact of the implementation of the BH reforms in 2013, with the number of BH claiming NSW revenue land tax exemption dropping dramatically in 2014, with a small but steady trend line decline continuing from 2014. Overall the decrease from 2013-2017 has been 18.6%. (1) In the 2017 tax year, 616 properties received the boarding house exemption. (a) 611 boarding houses provided less than full board and lodging, with only five providing full board and lodging for the taxing year. (b) 609 boarding houses are general boarding houses, with only seven being registered as assisted boarding houses for the taxing year. 3. Mandatory 5 year review of the BH Act. As per the Boarding House reforms in 2012, a mandatory 5 year review of the Boarding House Act was scheduled for 2018. This has been delayed and there have been no further updates since last year. 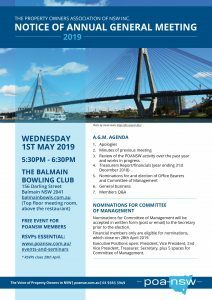 POANSW expects this review will not be initiated before the upcoming NSW election. The Affordable Rental Housing SEPP has been amended to ensure that boarding house development in the low density residential zone better reflects the built form and character of the surrounding area. These changes build on existing rules in the Affordable Rental Housing SEPP that ensure boarding houses are only approved where they are close to public transport and comply with parking rules as well as compatibility with the local character of the area.